It was a difficult four years for Nick and Nassim Pietsch as they started out their life together. 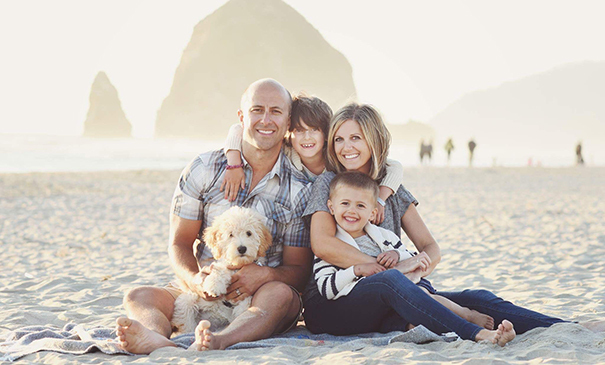 As Nassim built her dental practice in Seattle and Nick traveled as a sales representative for surgical supplies, they began to have a family with their two children Chloe and Cyrus. But Nassim would periodically experience dizziness, light-headedness, confusion and other symptoms that couldn’t be diagnosed. It took numerous consultations and Nick discussing the issue with the Virginia Mason surgeons he worked with, Adnan Alseidi, MD, Scott Helton, MD, and Tom Biehl, MD, to determine the problem and solution. Nassim was diagnosed with an insulinoma, a small tumor in the pancreas that produces an excess amount of insulin, leading to hypoglycemia, which can be a life-threatening condition. Virginia Mason surgeons removed the tumor, which wasn’t cancerous, and Nassim is completely recovered. Recently, Nick donated his first gift from his business to fight pancreatic cancer at Virginia Mason. “It felt great to give back to a cause dear to my heart while also challenging myself to create art that people love,” says Nick. “I hope to do even more next year!” Virginia Mason thanks Nick and his family for their dedication in helping others. To see more about cause marketing at Virginia Mason and Nick's designs, please visit www.virginia-mason.everydayhero.do/CauseMarketing.